Outside the monsoon months of June to September you can trek to Base Camp at pretty much anytime. However, the two most popular times to trek in the region are April and May in the spring or the autumn months of October and November. In the springtime, the trails are lined with an abundance of colourful wildflowers and you may meet expeditions at Base Camp, but temperatures can be hot and humid during the day and cloud often builds in the afternoon. Post monsoon, mid-October to mid-November, has traditionally been considered the premium time to trek when skies are clearer and temperatures pleasantly warm during the day but this means the trails and lodges are at their busiest. To avoid the crowds and take advantage of more predictably clear skies, late November or December is a great alternative. It will be much colder though at this time of year, especially at night and at higher altitudes, but well-layered clothing, a good four-season sleeping bag and a warm duvet jacket will help keep you snug. For those who really don’t mind the cold, a Christmas trek is a fantastic festive option. Fitness: The two-week trek to Everest Base Camp is not to be under-estimated. Steep climbs, long days on the trail and the effects of altitude can make it a real physical challenge, even for seasoned trekkers. To give yourself the best possible chance of making it all the way to Base Camp it’s essential to get in shape before you travel. You can build strength and stamina through jogging, cycling, swimming etc. but undoubtedly the very best preparation for walking is walking. Head out on foot whenever you can and ideally spend time in your local hills or mountains where you should tackle plenty of sustained ascents and descents. You definitely won’t regret having put in the hard miles when you finally stand at the foot of the world’s highest mountain. Medical: You need to ensure you are properly immunised for travelling in Nepal, so contact your doctor or travel clinic a minimum of six weeks prior to departure. Information is also available online at www.traveldoctor.info and www.fitfortravel.nhs.uk. It’s also sensible to book a visit to your dentist a few weeks before your trip just to make sure there are no dental issues which may come back to bite you – so to speak! Insurance: Comprehensive travel insurance is another essential and you need to ensure that your policy covers trekking up to 5,500m. Many policies exclude trekking or have very low height limits so it’s advisable to speak to your insurance company and get written confirmation that you are adequately covered well in advance. Trekkers in the Everest region also need to be registered on the Trekker’s Information Management System (TIMS) and you will also need a permit to enter the Sagarmatha National Park (the Everest National Park). These will both be organised for you when you book your trek with us, and the cost will be included in the price of your holiday. 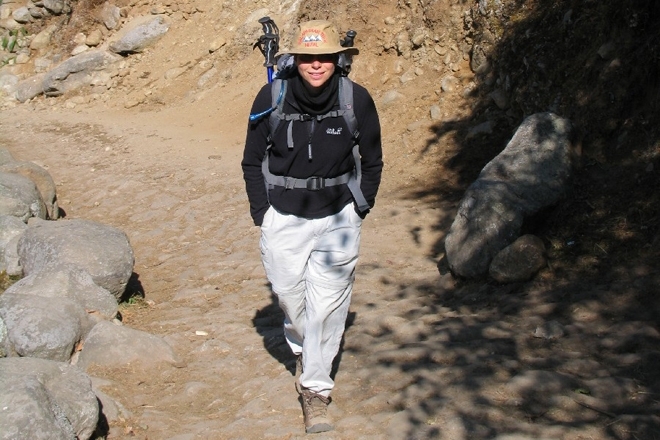 Your walking boots are your most important piece of clothing for your trek to Everest Base Camp. It doesn’t matter whether they are leather or fabric but they should be waterproof and, most importantly, well broken in. If you are buying new boots for your trek do so well in advance and wear them for plenty of long walks with lots of ascent and descent. After your boots, your outer layers are your next most important consideration. You need a good windproof/waterproof jacket and trousers and they should preferably be made from a breathable fabric such as Gore-Tex or equivalent. For cold evenings at high altitude a down jacket will be an invaluable addition – we provide a good quality down jacket free of charge for all our treks in Nepal as well as a four-season sleeping bag. You will also need a warm hat and gloves as well as a sunhat and a scarf or ‘Buff’ to cover your nose and mouth on dusty paths – this will help protect from coughs and sore throats. You should plan the rest of your clothing on a layering basis and take lightweight and quick-drying fabrics whenever possible. Don’t pack your shorts though as these are not culturally appropriate – particularly for women. Just make sure that everything fits into your kit bag and that you are within your weight allowance. The luggage allowance on the domestic flight from Kathmandu to Lukla is only 15kg - including hand luggage. This limit is pretty rigorously applied so you’ll need to pack carefully. Don’t load yourself down with too much equipment on trek. During the day you will carry a day pack (around 30-40 litres is a good size) in which we recommend you have your camera, waterproofs, extra layers, small first aid kit, water bottle, head torch, any snacks, antibacterial hand gel and some tissues. Take trekking poles if you use them and, for the evenings, perhaps a book or two or some travel games to while away the hours at the end of each day’s walking. Most tea houses or lodges on the trail have charging facilities for electrical equipment which you can use for a small fee. As this facility is in big demand try not to take too many gadgets with you, instead think of your trek as a rare opportunity to leave the modern world behind. A top packing tip is to organise your kit into waterproof stuff sacks, plastic bags or bin liners within your main kit bag, then you know everything will stay dry whatever the weather. Your bag has to be carried by yak or porter so a soft-sided waterproof holdall is a must – Mountain Kingdoms gives a free kit bag to all its trekking clients. For a comprehensive checklist of what to take see our blog - Kit list for an Everest Base Camp Trek. 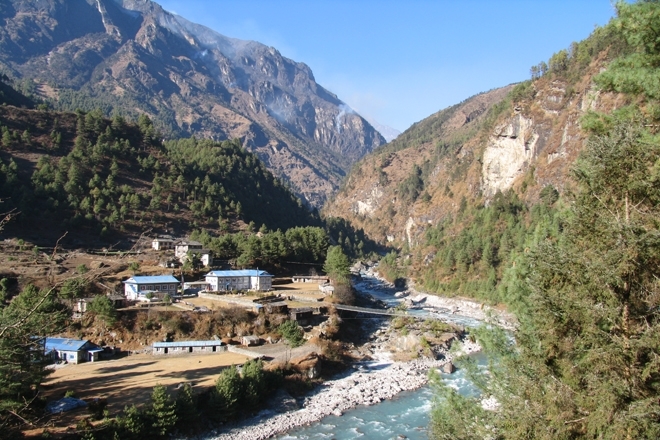 So that's your essential information for preparing for a trek to Everest Base Camp. In part 2, we'll tell you about the trail to Everest, what to expect for your food and accommodation, how to stay healthy and how to travel responsibly. In the meantime, find out more about our classic Everest Base Camp Trek and also our Everest Base Camp in Style trekking holiday, or see all our Everest treks. If you have any queries then just email info@mountainkingdoms.com or call our travel experts on 01453 844400 who'll be very happy to answer your questions.